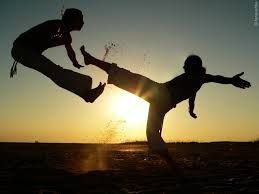 The heart of every person who plays capoeira is in his or her ginga, in Portuguese it really means ‘to sway back and forth’ but in the capoeira world it means the ‘fighting stance’. In the 16th century, slaves used capoeira’s dance-like appearance as a way to hide their training of combat and self defense. Historical records reveal that this unique sport has been brought into Brazil way back in the 16th century by the slaves from Angola. Basically it is a combative sport disguised in a dance form with music. The ginga is the most important move for a capoeirista to be able to perform at length. It is the fundamental building block of both Capoeira Angola and Capoeira Regionial, and has a very colorful history as a movement in the sport. Not only is capoeira fun, it also improves coordination, cardio, muscle tone, musicality and teaches you a new language and culture. Though Brazil is renowned for Football in sports field, Capoeira retains the popularity among the masses and rightly declared as the National Sport of that country. The ginga is also unique from a martial arts perspective, since most other traditional fighting stances are static and forward facing. The ginga is the total opposite. The ginga is a set of movements that starts with the feet a little over shoulder width apart. This is the base, or cadeira. From there, the player takes turns bring his legs back behind the other then back to the base. A picture is worth a thousand words, however, so if there is any conclusions a quick internet search for 'ginga' is sure to clear up any ambiguity. Capoeira is a martial art that grew from survival that was created by slaves brought to Brazil from Africa. They expressed their martial arts into a form of dance to resist oppression and lifting their spirits. In Capoeira, many movements are carried out while in a handstand position, often resembling modern Breakdance moves.